For several years, devoted Condor Watchers have carefully documented feeding positions and chatted about scale antics and juvenile floofs. Thanks to a new addition to our team, Lisa Natale, a graduate student in the Interdisciplinary Quantitative Biology Program, and the Ecology and Evolutionary Biology Department at CU Boulder with a background in pure mathematics, we’ve now had our first detailed look at the data and we’re excited to share the results! While these network snapshots may look like crude connect-the-dots artwork, there is a lot we can glean from them. Clusters of dots represent groups of birds commonly seen feeding together; the tighter the cluster, the more interconnected the group of birds. Likewise, a lack of connection between two birds indicates that they were not seen feeding together in the given time period. To some degree, disconnected groups of birds are explainable by geography—birds that frequent feeding stations in Central CA are unlikely to be seen with those feeding in Southern CA—but disconnects may also arise from behavior like social avoidance. These network snapshots begin to shed light on the social structure of the condor population, and in particular how it changes through time. This was the foundation we needed to begin exploring whether and how a bird’s social status affects its risk of lead poisoning, something we are very interested in as lead poisoning is the number one threat preventing condor recovery. Initially, we hypothesized that dominant birds suffer greater exposure to lead, as they feed earlier among the group. Because condors are equipped with beaks designed for tearing into existing wounds in a carcass, rather than making fresh wounds, we believed that feeding earlier would mean feeding closer to the initial wound site. In abandoned game, this may be a lead bullet entry point. Hence, dominant birds feeding early may be at higher risk of ingesting a piece of spent lead ammunition. Our condor social network snapshots and the positions of birds through time during a feeding bout allow us to explore this idea by inferring feeding hierarchies among the birds. From these hierarchies, we can assign individual birds a social rank in the population and examine whether this rank influences their risk of poisoning going forward. Using the Condor Watch data accumulated to date, a condor’s rank is not a reliable predictor of whether it will suffer poisoning in the near future. Interestingly, prediction accuracy increases when we look at networks generated on shorter timescales. Unfortunately, these short-timescale networks must be built with smaller pools of photo data. We are hopeful that the links between social rank and lead poisoning risk may become clearer as we accumulate additional data to allow definition on short timescales. One factor that may obscure the links between dominance and lead-poisoning risk and increase the predictive accuracy of short timescale networks is the striking lack of stability in condor social networks, especially early in the release program. The evolution of the social structure apparent in our preliminary analyses is exciting and presents many interesting angles to pursue! We are especially curious to learn what contributed to social instability among the condors early in the release program and what factors led to increasing social stability through time. Better understanding of what is disruptive to condor flock structure may help us preserve the integrity of the social network of this highly managed population as it grows over time. A stable social network may prove to be a critical piece of successful recovery for these gregarious birds. We couldn’t do any of this without you! So please, keep on clicking to tell us which birds appear where. Thank you for your efforts and care; with every picture you annotate you are enabling this and further research. We are deeply grateful for this opportunity to be working with you to aid and understand these awe-inspiring birds. 5:00-9:00pm – Saturday, March 18th Libbey Bowl – Ojai, CA Free! Janet Hamber began her field research on the California condor in the 1970’s as a biologist at the Santa Barbara Museum of Natural History. A true Trailblazer for Women in Science and a remarkable inspiration for generations of conservationists on this 50th anniversary of the very first endangered species list. The Condor’s Shadow is an engaging year-in-the-life film that follows a feisty condor named Pitashi and biologist Joseph Brandt of the Ventura-based USFWS California Condor Recovery Program. Ventana Wildlife Society just posted two photos on Facebook of the first wild-raised condor chick to enter the flock in over 100 years at Pinnacles National Park! This seemed like great news to send us into the weekend. We were struck by the gorgeous blue neck of father Condor 340 in the photo. This image nicely complements our post on the colors of condors. A few of the CondorWatch Scientists just published a new paper in the journal Environmental Science and Technology documenting that condors eating marine mammals carcasses along the Big Sur Coast of California are exposed to potentially harmful contaminants. Because marine mammal carcasses can be an abundant food source for condors and are thought to have helped prevent their extinction at the end of the last ice age, people welcomed the inclusion of marine mammals on the condor’s menu. However, marine mammals, and California sea lions in particular, are known to contain high levels of toxic chemicals such as DDE, the main breakdown product of the agricultural pesticide DDT. Now you might be thinking “But DDT was banned for use in the United States decades ago?” Yes, that is true, but unfortunately DDE is very persistent and is still around today – especially in tissues of marine predators such as California sea lions. DDE has been shown to cause eggshell thinning and reduced hatching success in birds and DDE exposure has been linked to population declines of multiple species, including the bald eagle, peregrine falcon, and brown pelican. Our new study estimated that about 40 percent of breeding-age coastal condors have DDE levels at or above levels that caused eggshell thinning in bald eagles and about 20 percent meet or exceed levels associated with nest failure in bald eagles. 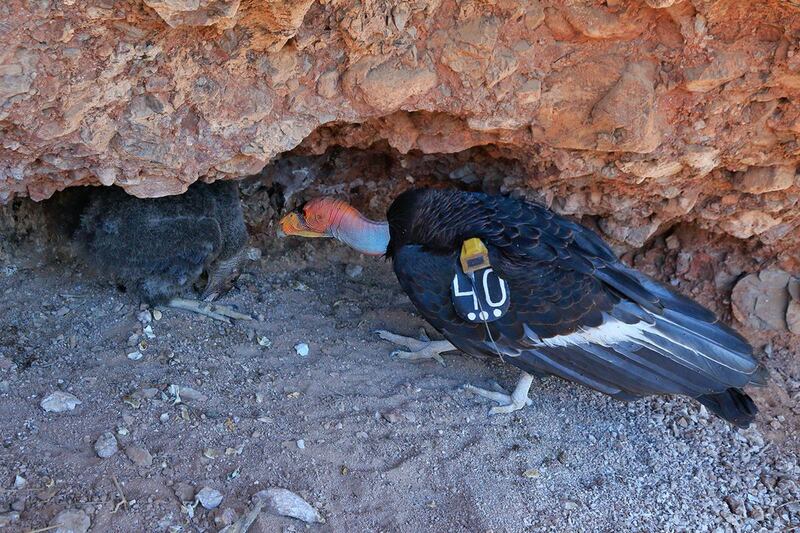 A prior study led by one of our condor collaborators, Joe Burnett with the Ventana Wildlife Society, has documented that condors on the coast have thinner eggs and reduced hatching success compared to condors that breed inland. So, what do we do? Well we do know that lead poisoning is the number one cause of condor mortality and our prior work has shown that if we eliminate or greatly reduce lead poisoning the condor population can recover. However, it is worrisome that condors ingest DDE along with a full cocktail of other contaminants when feeding on marine mammals, especially California sea lions. Our team is currently working to assess the effects of decreases in nesting success due to DDE on condor recovery. Ultimately, our study highlights a harsh reality: we are all being exposed to multiple contaminants throughout our lives — even us humans! We should do what we can to minimize exposures we have the most control over (lead-free ammunition anyone?!) and also push to reduce our use of toxic chemicals as individuals and as a society. In the end the condor is one tough bird and we are hopeful that even though DDE might be a hurdle that impacts some coastal birds, across California condor chicks will keep hatching and the numbers of condors soaring in the sky will continue to grow. On April 28th and 29th some of the scientists involved with CondorWatch (Vickie Bakker, Dan Doak, Myra Finkelstein and Zeka Kuspa) held a workshop with condor biologists and managers to talk condor conservation. The workshop centered around how we can use models to predict the future population health of condors given different management scenarios. This approach is very useful for managers to understand how different threats and actions can influence a species’s future survival. We had a productive workshop and one topic talked about A LOT was the importance of social structure to individual behavior. Indeed the field biologists again hypothesized that birds that hang out together may have similar lead exposure risks, and thus understanding social structure could help prioritize at-risk birds for enhanced monitoring. We think the knowledge of how social behavior influences a condor’s risk of lead poisoning (among other things) gained through the CondorWatch project will be critical to helping ensure that condors keep flying over our skies in the future! Condor Workshop members from left to right: Dan Doak (University of Colorado Boulder), Chris West (Yurok Tribe), Vickie Bakker (Montana State University), Steve Kirkland (US Fish and Wildlife Service), Devon Pryor (Santa Barbara Zoo), Joe Burnett (Ventana Wildlife Society), Joseph Brandt (US Fish and Wildlife Service), Myra Finkelstein (University of California Santa Cruz), Brent Johnson (Pinnacles National Park), Alacia Welch (Pinnacles National Park). So, thank you for your help with CondorWatch! So, for all you CondorWatchers out there I thought it would be fun for you to see a series of feeding station photos that illustrate just how quickly a group of condors can pick clean a carcass. Scroll through this series and see that after ~2 hours all that was left of the carcass was the bone that was staked to the ground! As Wreness would say “you win a Fish!” if you have classified any of the photos shown here in the series on CondorWatch. Thanks to everyone on CondorWatch for helping us classify photos – we couldn’t do this without you! Or, how likely is a condor to survive from one year to the next, given the different things a condor does or does not do. Understanding the things associated (or possibly affecting) a condor’s survival is key to managing them to optimize their chances of survival year after year. 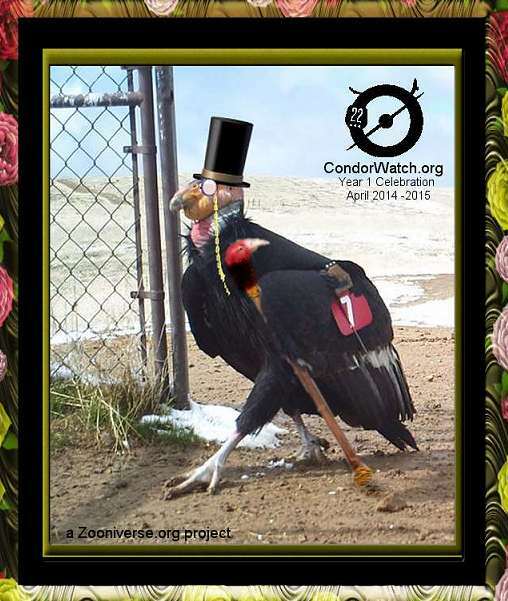 Condors start breeding around 5 years of age (give or take – everyone is an individual!) so in order to replace itself, each generation a condor pair has to survive at least until they successful raise two chicks (or really a bit more than two to account for mortality). Then, condors are believed to be able to live up to 70 years! (or more – who knows??) The current flock is made up of young individuals, with the oldest just barely approaching middle age (e.g., Orange 21, the southern flock patriarch, is ~36, while the senior birds in the central flock are only ~20). Eventually carcass gatherings should include long-lived individuals that win the survival lottery — bird equivalents of your great-grandma at the family reunion, passing on stories of where the best dead things are found, how to avoid those pesky ravens and so on. The main thing we found is that although managers are making progress in decreasing mortality risks for condors, the behaviors affecting survival most – such as feeding at the feeding stations where CW photos are taken – are also changing through time, and these changing behaviors tend to increase mortality risk for condors. So, like most things in life, “it is complicated”. As the flock has grown in size the birds are doing different things and this underscores the importance of CW to help us understand how a bird’s behavior at the free-food buffet (aka proffered feeding sites) is changing over time and affecting their survival and lead poisoning risk. So, thank you to all you do on CW! FYI – this paper will be part of a Supplementary Issue in EcoHealth on Health and Disease in Translocated Wild Animals that is a result of a symposium that I attended in the spring of 2015. For more information on symposium see http://www.zsl.org/science/whats-on/health-and-disease-in-translocated-wild-animals. We have seen condor nestlings ingest items such as coins, bottle caps and even a light bulb filament! 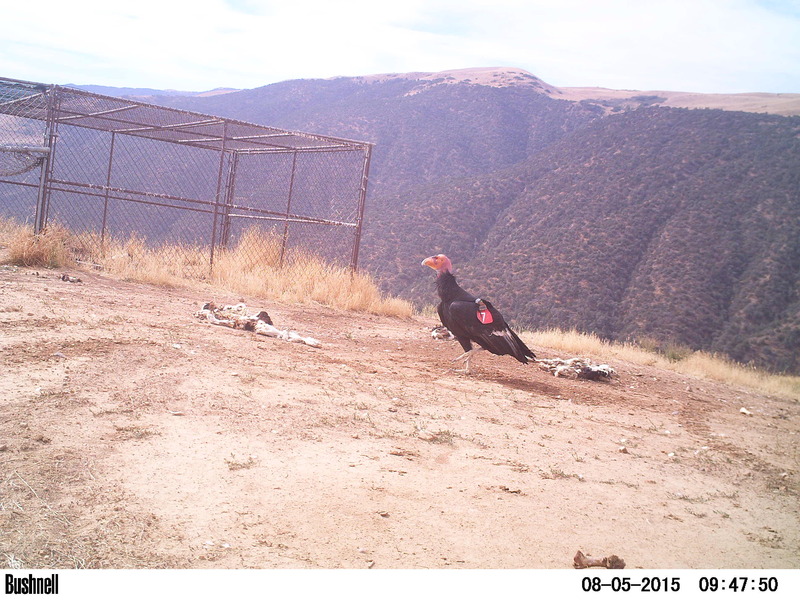 In addition to digestive impaction, trash ingestion may have toxicological effects on condors. Zinc toxicosis associated with trash ingestion was determined to be the cause of death for one condor nestling, and in two other cases nestlings that died of trash ingestion had elevated liver copper concentrations. Condors are routinely lead poisoned by ingesting lead fragments in carcasses shot with lead-based ammunition, but it has been less clear whether trash ingestion represented another source of lead poisoning. To address this question, some of our science team members and condor collaborators recently published a paper entitled: “Lead Exposure Risk from Trash Ingestion by the Endangered California Condor (Gymnogyps californianus)” in the Journal of Wildlife Diseases. Because ingested or potentially ingested trash accumulates in nest areas, we sampled items found in the vicinity of nests or removed from nestlings. 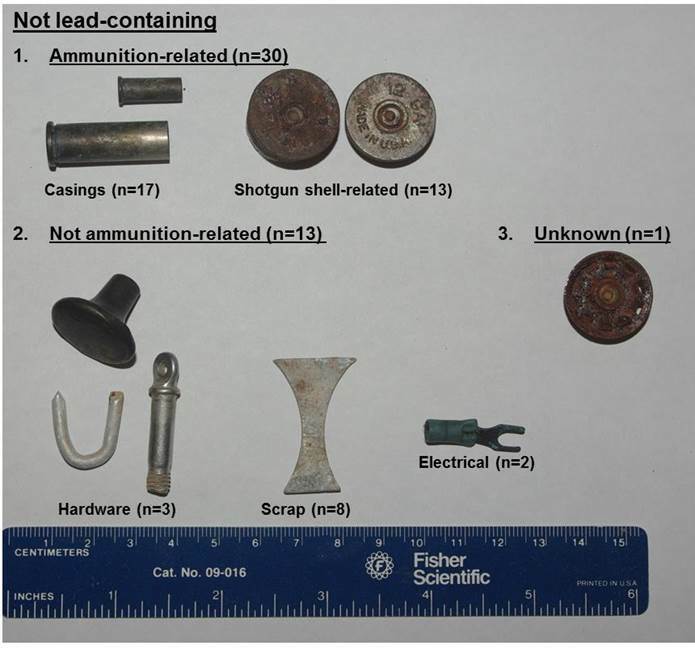 We found that the majority of lead-containing trash items were ammunition-related. Out of 1,413 trash items collected from condor nest areas and nestlings in the Transverse Range of Ventura County, California USA, between 2002–2008, 27 items were found to have lead concentrations of potential toxicological concern. 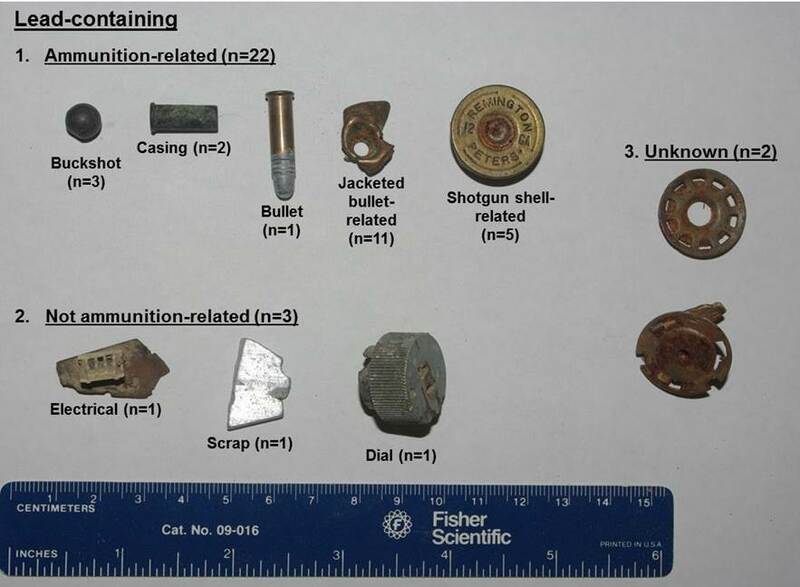 Twenty-two of these 27 items were clearly ammunition-related (shotgun shell, casing, etc., see photos below) and only three of these items were clearly not ammunition-related (two items un-classifiable). Our results suggested that trash ingestion of non-ammunition items does not pose a significant lead exposure risk to the California condor population in California, but ingestion of ammunition-related trash could be of concern and efforts to minimize a condor’s exposure to ammunition-related trash are warranted. 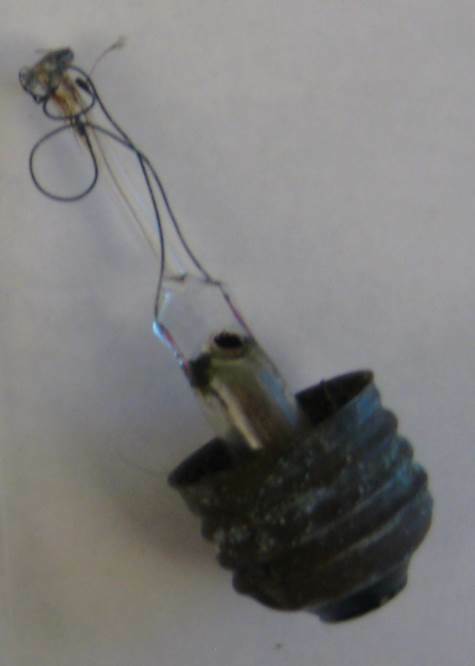 Metal items were categorized as ammunition-related if they were clearly identifiable as such with corroboration by a California Department of Fish and Wildlife Lieutenant and a retired Assistant Chief with a combined 48 years of experience in law enforcement (J. Nores, C. Babich). Items with a leachate lead concentration >1 µg/mL were classified as containing sufficient lead to be of potential toxicological concern and referred to as ‘lead-containing’. And just because we can’t have a blog post without a condor photo, here is one of condor 107 (red7), proudly strutting his stuff in an area free of trash! Cheerio! Great week for classifying last week! To all our fabulous CondorWatchers! Thanks to you we had a great week last week with close to 3,000 classifications! that is twice as many as the week before and almost 3x as many as the week before that! So, in honor of your hard work, I am resurrecting the fabulous red7 photo that our talented Wreness did for our one year anniversary! Lets try for another record week and, as Wreness would say “Keep on carrion”!